"Should be read by anyone interested in understanding the future," The Times Literary Supplement raved about the original edition of The Social Life of Information. We're now living in that future, and one of the seminal books of the Internet Age is more relevant than ever. The future was a place where technology was supposed to empower individuals and obliterate social organizations. Pundits predicted that information technology would spell the end of almost everythingfrom mass media to bureaucracies, universities, politics, and governments. Clearly, we are not living in that future. The Social Life of Information explains why. 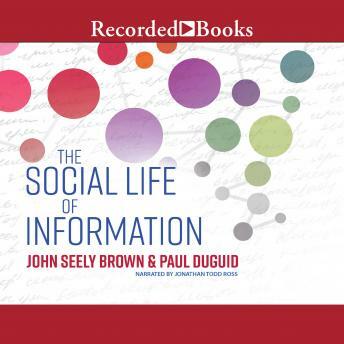 John Seely Brown and Paul Duguid show us how to look beyond mere information to the social context that creates and gives meaning to it. Arguing elegantly for the important role that human sociability plays, evenperhaps especiallyin the digital world, The Social Life of Information gives us an optimistic look beyond the simplicities of information and individuals. It shows how a better understanding of the contribution that communities, organizations, and institutions make to learning, working, and innovating can lead to the richest possible use of technology in our work and everyday lives. With a new introduction by David Weinberger and reflections by the authors on developments since the book's first publication, this new edition is essential reading for anyone seeking to understand the human place in a digital world.